The mid-point of most professional sports seasons is easy to find. Either the games add up nicely for you, or there’s a convenient All-Star break. Football is different. Bye weeks and the travesty known as the Pro Bowl give us a season that barrels ahead from September until early February. That said, With Week 10 in the books, it’s a pretty safe bet that we’re just past halfway. Some teams have played 10 games but everyone has at least played 9. Since we’re here, I thought it might be fun to take a look at who’s in the running for the leagues major awards. Let’s have at it! Benjamin has been a stud since day one, and he definitely benefits from being one of two offensive options for a Carolina team that has featured Cam Newton-lite this season, mostly due to injury. Newton is throwing more and running less, and Benjamin has reaped the rewards. Watch out for Mike Evans however. A big prospect before the season, Evans was hurt physically and hasn’t been helped by the quarterback play of the two headed turd-in-the-punchbowl that is Tampa’s Josh McCown/Mike Glennon combo. A huge game in Week 9 hinted that Evans was finally getting the hang of things and he followed it up with another monster in Week 10. Tampa is also terrible, so lots of passing should be in their future. Benjamin had a bounce back two TD effort after a couple down weeks but look out – Evans is on the rise. 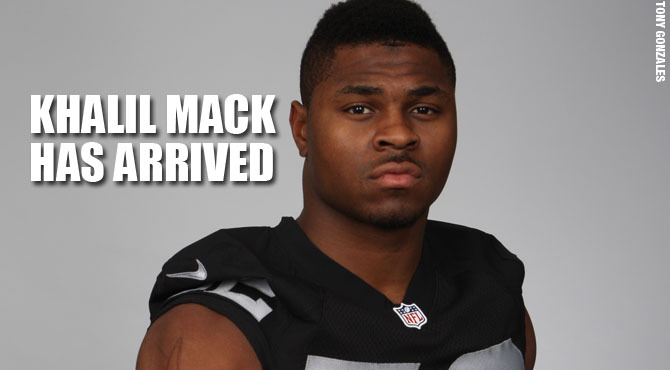 The Contenders: Khalil Mack, LB Oakland Raiders, Khalil Mack, LB Oakland Raiders, Mhalil Kack, LB Rakland Oaiders. I mean, wait, what? The Dark Horse Nobody’s Talking About: Anthony Barr, LB Minnesota. Except that this guy already did! He had more space than me. Have a read. He makes some great points, but I think it’s Mack’s award to lose. Let’s give the Raiders SOMETHING, amirite? I know, I know. Dallas Cowboys fans just had a stroke. 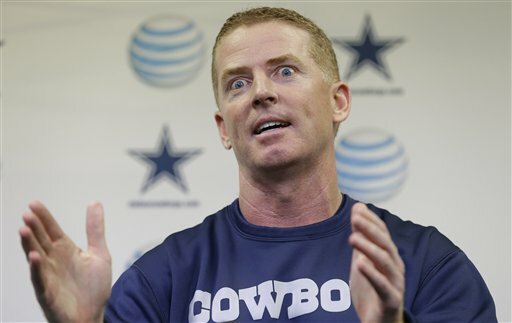 Jason Garrett is widely perceived to be terrible. He looks like a weiner. I don’t think I’d like him either. But if the Cowboys win 11 or 12 games and host a playoff game? Who expected that before the season started? Wouldn’t he deserve some credit? Nah OK, you’re right. He wouldn’t. I do think Arians will win the award – Arizona has been resilient, tough and fun to watch, all while being decimated by injuries on defense. If they can overcome the loss of quarterback Carson Palmer to win the NFC West, Arians is a lock. WHAT did you just say about Jason Garrett?! 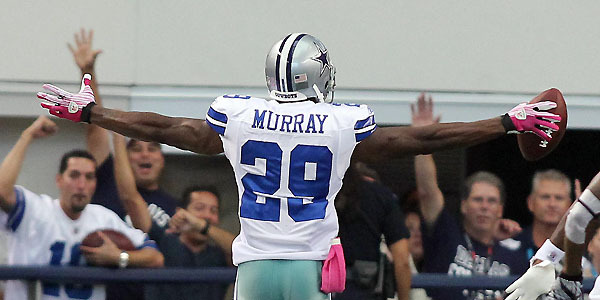 Murray has rushed for 1233 yards in 10 games. That is insanity. He is also being used at a completely unsustainable rate and he’s either going to have cede some carries to his backups or he might literally run into the ground like in Looney Tunes. He’s only had 19 carries each of the past three weeks, so Dallas has begun to limit his touches. I had Brown in the Dark Horse slot until I realized that Jerry Rice name-checked him recently. People have noticed how good a season he’s having – that said, 1070 yards receiving and 8 touchdowns in 10 games is otherworldly, and he’s a real contender for this award. 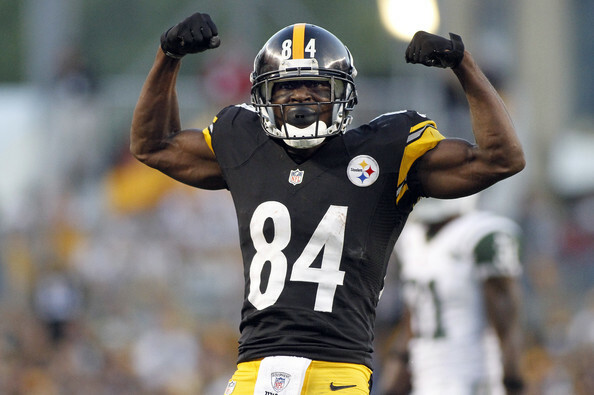 Also, Antonio… I mean he’s an intense guy. He wants it! Can’t we give this as a joint award? The Bronco’s were eviscerated in the Super Bowl last year not only because their offense was stifled by the Legion of Boom, but because their defense couldn’t do a damn thing to Russell Wilson. With Miller healthy and Ware added in the off-season the Broncos look nasty on both sides of the ball and a loss at New England aside, are the favourites to win the AFC this season. 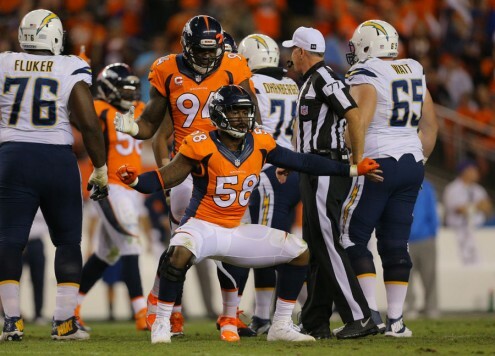 I think Kuechly or Watt could win the award as the best defensive players in football (they’re both the best at their position) but I’d love to see the Broncos tandem be honoured. Before last Sunday I had Rodgers included in the Offensive Player of the Year conversation and Brown in the MVP race. 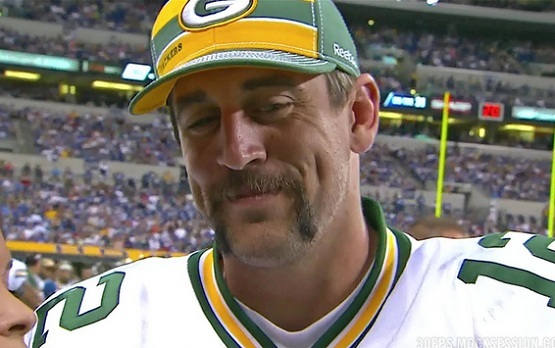 I wrote ‘Rodgers has thrown just three picks all season, all of which were tipped. He’s through his bye week and his passing yard numbers are low because the Packers have been involved in three blowouts so far – two on the winning side. This has led to a lot of running by the Pack and toned down Rodgers overall statistics. I could definitely see him ripping off some big games in the near future and getting himself back in to the conversation for both this award and the MVP’. Full disclosure, I’m a huge Packers homer, but what happened against Chicago on Sunday should vault Rodgers back into the midst of the MVP conversation. I know people want to give it to Luck because it’s fun to christen a ‘newest, youngest’ of anything, but Rodgers is in his prime and is the best QB in the game. His six TD first half is a calling card on what could wind up being one of his finest all-around seasons. Just give him the MVP already. Do it for me. The Saints are on a rollercoaster. Pre-season favourites, written off prematurely and now, division leaders. Don’t count them out come playoff time. Ain’t nobody like to play in the Super Dome. The Dolphins lost this last week too, but it was to a legit team in the Detroit Lions. They’ve been down to the wire in losses to the Packers and Lions, and they’ve lost to solid Buffalo and Kansas City teams. They have victories over the Patriots, Chargers and Bears. They still have three easy games left with two against the Jets and a third against Minnesota – if they can win all three of those, they just need to pull out two other wins to get to 10-6. It’s doable, I tell ya! Dagonas is about to plotz! Now some many say this article is late – that mid-season was two, possibly three weeks ago and that I’ve conveniently hedged to get more information until now. To those I say – the SuperBowl is three months away! The season started three months ago! Do the math, asshats! Exclamation point! Good day.